Camillus Kessler was born in Ottawa, Kansas, on March 3, 1883, according to his World War I and II draft cards. In the 1895 Kansas State Census, he was the youngest of two children born to John and Minnie. Their home was in Ottawa. The Ottawa Herald (Kansas), January 15, 1987, reported the Franklin County Historical Society event devoted to Kessler. One local boy who “made good,” did so as a nationally syndicated cartoonist, but has been almost completely forgotten by Ottawans and the public at-large…. Kessler grew up in Ottawa in the 1880s and ’90s and attended the public schools here. His father, John B. Kessler, and a partner had purchased the Queen City Herald newspaper here in 1883, about the time of Camillus’ birth…. Details of Camillus Kessler’s cartooning career are even more obscure. His talents presented themselves at an early age, however, for when he was still in his teens he drew a series of excellent caricatures of prominent local businessmen…. Camillus Kessler was telling me about the old days down in Oklahoma when his father ran the daily newspaper and he delivered it on ponyback. In those days, newspapers being hand set, there was always a demand for printers. So the elder Kessler would telegraph up and down the Katy railroad to have tramp printers headed this way. Most of them would work a week and get drunk on pay day. Muskogee didn’t have much of a caboose. But it was strong enough to hold the tramp printers. So every Monday morning, Editor Kessler would go to the coop and pay the fine of $2, so he could get out his paper, the fine, of course, being deducted from the next week’s wages. How long they stayed in Muskogee is not known. Gould’s 1908 Directory, St Louis, Missouri, listed Kessler at 4273 St. Louis Avenue and his occupation as artist with the Republic. The 1910 directory said he was a St. Louis Star cartoonist and resided at 4254 St. Louis Avenue. The same address was recorded in the 1910 census which said he was married to Edith. 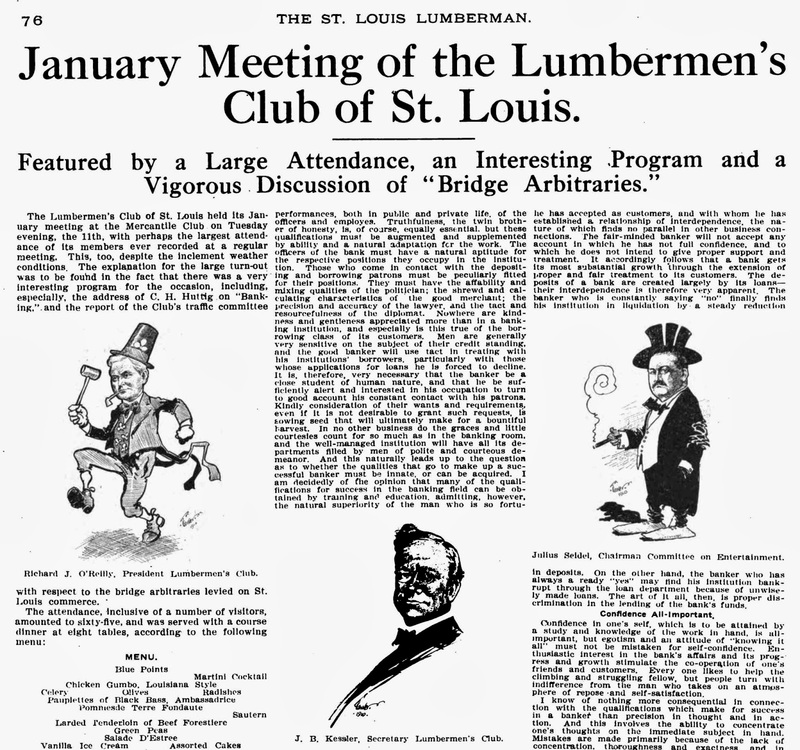 The St. Louis Lumberman, January 15, 1910, published three drawings by Kessler, including one of his father (middle column). A full-page feature, “Back of the Footlights by C. Kessler”, appeared in Cartoons Magazine, March 1913. At some point, Kessler moved to New York City. According to American Newspaper Comics (2012), His cartoons appeared in the New York Press from January to June 1914. The 1915 New York State Census listed cartoonist Kessler and Edith in Manhattan at 839–841 West 179th Street. The same address appeared on his World War I draft card. The description of him was medium height and build with gray eyes and brown hair. 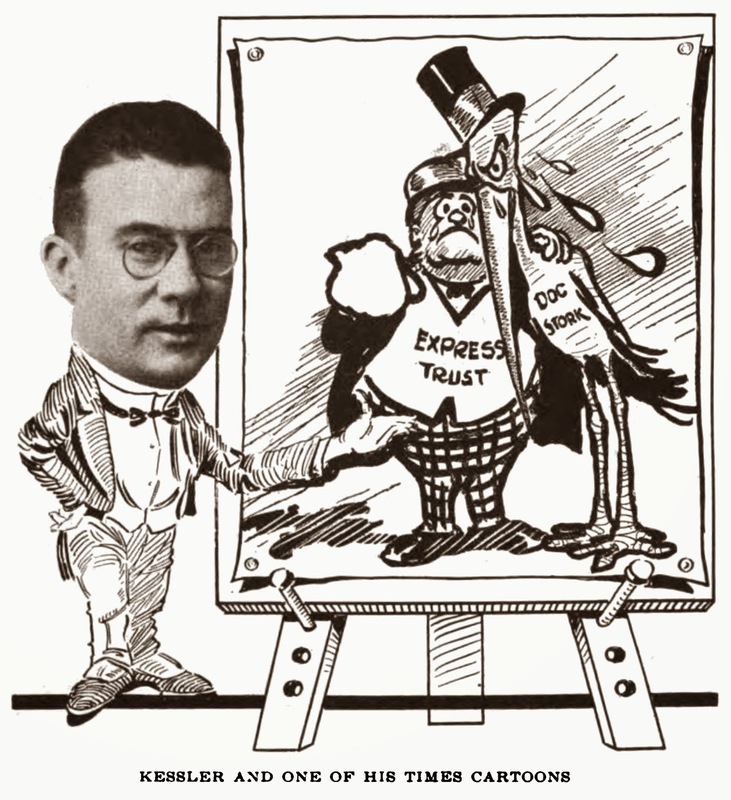 The self-employed newspaper artist signed his draft card on September 11, 1918. Regarding Prohibition, Kessler wrote a letter to Leslie’s Weekly which was reprinted in The Mixer & Server, February 15, 1916. Cartoonist C. Kessler, who made most of the cartoons in the souvenir program, sat at a small table in the center of the room, and as he drew cartoons they were projected on a screen suspended from the upper balcony. These cartoons were of persons present in the audience and created considerable laughter. Kessler illustrated two full-page articles by Arthur James Pegler which were published in the New York Tribune, August 7, 1921 and October 23, 1921. One of his At the Bottom of the Ladder cartoons, for the New York Globe, was reprinted in Publishers Weekly, September 16, 1922. A 1926 issue of The Bookman noted the upcoming release of the book, At the Bottom of the Ladder, and offered an explanation on how the series started. The cartoon in question shows young Gary busily engaged with an ax, making wood fly, as well as several farm animal, while a too inquisitive cow has been caught squarely between the eyes by a flying billet. Another Kessler series, In for Life, for the New York World, had a short run from March 5 to 31, 1928. 25 Years Ago Today would be his longest-running series, from 1929 to 1949. The 1930 census found newspaper cartoonist Kessler in Palisades Park, New Jersey at 206 Harnet Avenue, where his home was valued at $10,000. In this decade, Kessler produced the weekly panel, Making the Grade (1930 to 1932), and the daily panel, Home Town Echoes (1939 to 1950) which had alternate titles such as On the Home Front, Seems Like Yesterday, and True to Nature. The Ottawa Herald said: “Kessler’s nationally syndicated “Seems Like Yesterday,” and “Home Town Echoes” cartoons were often based on his early days in Ottawa.” Kessler’s cartooning career was discussed in this earlier post. After a few years, Kessler moved to 417 Tenafly Road in Englewood, New Jersey, as recorded in the 1940 census. His highest level of education was four years of college. In 1939 he worked 46 weeks and earned $2,974. Kessler signed his World War II draft card April 26, 1942. His address was 45 Hillside Avenue, Cresskill, New Jersey, and his employer was the Bell Syndicate. He was five feet eleven inches, 160 pounds, with gray eyes and black hair. Kessler passed away October 12, 1950, in Oak Hill, Missouri, according to his death certificate. He was buried in the family plot at Hill Cemetery, Bourbon, Missouri.